High Power Biological Microscope Set. 300x, 600x, 1200x Microscope with Viewing Head. In Nice Hardened Plastic Carrying Case! Battery Powered Illumination (Uses 2 AA Batteries, not included). Includes Everything That’s Needed to View and Create your own Slides. Great for the Little Student Studying Plant-Animal-Mineral Specimens. This is a Great Starter Kit for the Little Scientist. If you need a More Advanced Kit, Please Call us to Discuss our Other Items. Compound light microscope for use with viewing biological specimens on slides. 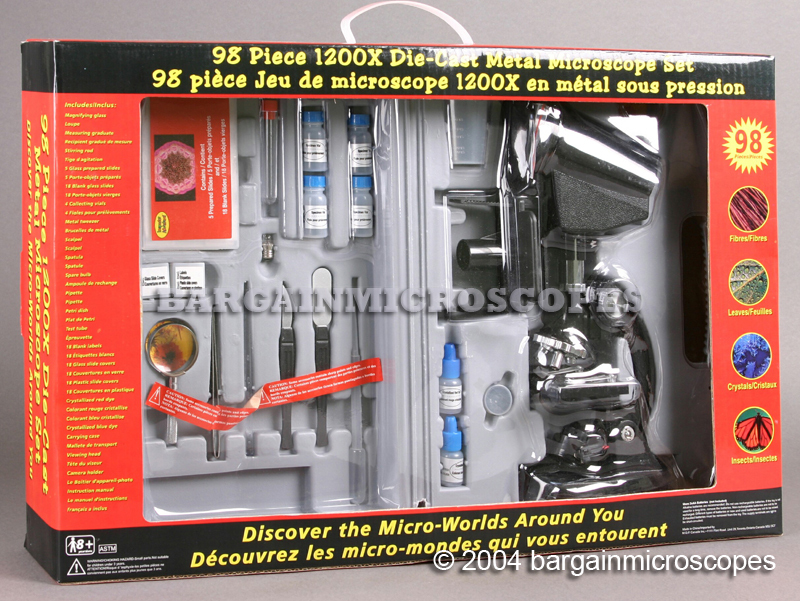 This toy microscope makes a great gift for the beginning scientist. The microscope set is completely new and ready to start learning on. Metal Tweezer, Stirring Rod, Spatula, Scalpel.